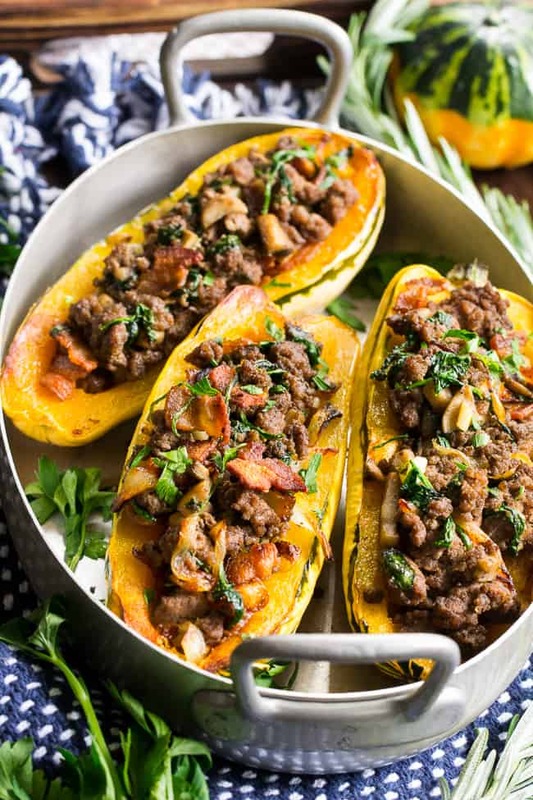 Delicata squash is roasted to perfection and stuffed with ground beef, caramelized onions, bacon, spinach, mushrooms and seasonings. 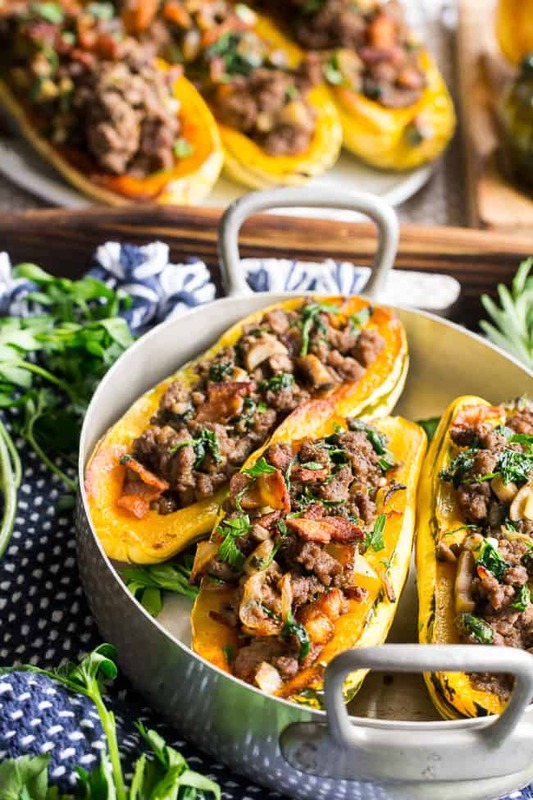 This cozy paleo and Whole30 stuffed squash is great for any meal or as a side dish. 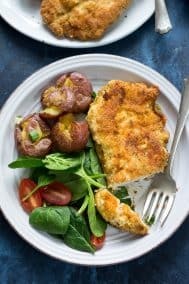 Savory, filling and healthy! 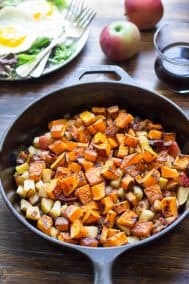 I’m still on a huge winter squash kick and I’ve decided, wholeheartedly, that my favorite way to enjoy winter squash is roasted and stuffed with ALL the goodies. 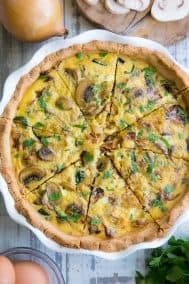 Between the onions, squash, beef, bacon, mushrooms and spinach, you are set for life – just you wait and see. 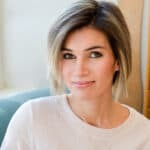 As for the bacon – If you need the recipe to be Whole30 compliant I highly recommend trying out the sugar free pork bacon from U.S. Wellness Meats. 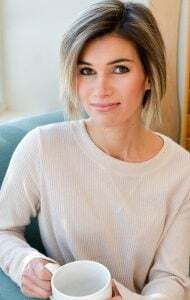 Overall this recipe is super straightforward, although there are several different steps. In summary, you cook the bacon first – especially if you want to use the rendered fat for the rest of your cooking. 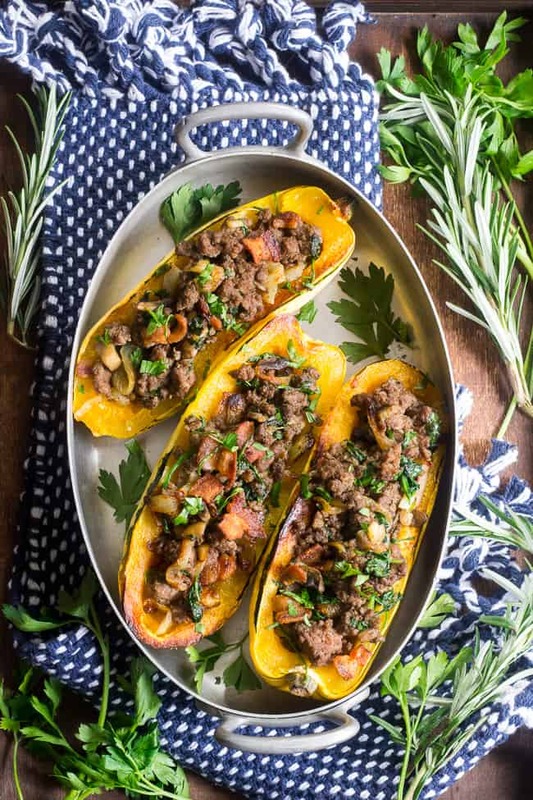 Then you simultaneously roast the squash, while two separate skillets are sizzling on the stovetop – one for caramelizing the onions, and the other for cooking the veggies and beef. The beauty of it all is that everything is ready at the same time – multitasking in cooking makes me happy! Lastly, you just stuff the squash and broil for a few minutes to get everything perfectly toasty. 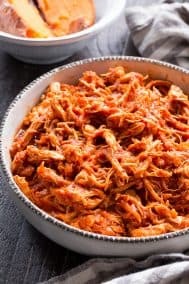 Since it does take a solid 40 minutes from start to finish, it’s also a great recipe to make ahead of time, (leftovers are great reheated in the oven) or even to prep/cook parts of it ahead of time so you can put it together really quickly on a weeknight. I hope you’re ready to get started! 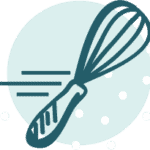 I know you’re going to love this one – get that oven preheated and let’s cook! Preheat your oven to 425 degrees and line a large baking sheet with aluminum foil. Cut each squash in half lengthwise and scoop out all the seeds and strings, forming a “bowl” for the stuffing in the center. Brush each squash half with cooking fat and sprinkle lightly with sea salt. 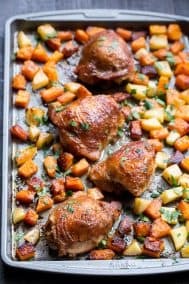 Place face down on foil lined baking sheet, and roast in the preheated oven for about 20-30 minutes, or until the back of the squash feels soft when pressed gently. Cooking time will vary depending on the size of your squash. Once done, remove from oven, leave the squash halves on the baking sheet and set aside until ready to stuff. Meanwhile, heat a large heavy skillet over med/hi heat to cook the bacon. Add bacon pieces and stir to evenly brown, once crisp, remove with slotted spoon to drain on paper towel, set aside. Reserve rendered bacon fat if planning to use, or discard if using another cooking fat. To caramelize the onions, you can either use 3 Tbsp of rendered bacon fat, or a preferred cooking fat. You can use the same skillet you cooked the bacon in, or a separate one, since the onions will cook separately from the rest of the stuffing. Heat cooking fat in skillet over low heat and add all the sliced onions, stirring to coat. Sprinkle with 1/4 tsp salt and cook over low heat, stirring every 5 minutes to prevent burning. Once onions have been cooking for about 20 minutes and are deep golden brown, remove from heat and set aside. Meanwhile, while the onions are caramelizing, add a bit of reserved bacon fat or cooking fat to a separate large skillet and heat over medium. Add chopped mushrooms and stir, cook for a minute until soft, then add garlic. Continue to cook and stir until garlic softens, then crumble in the ground beef. Sprinkle with 3/4 tsp salt, the pepper and poultry seasoning, and cook, stirring to break up lumps and evenly brown. Once beef is browned, lower heat and stir in spinach to wilt. Remove from heat and add in the caramelized onions with a slotted spoon, leaving excess grease in the skillet. Stir in the cooked bacon to complete the stuffing. 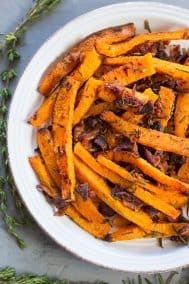 Preheat your broiler and generously fill all roasted squash halves (stuffing should fill 6-8 squash halves depending on size) then place the baking sheet under broiler and broil until the top is nicely “crisp”, abut 2-5 minutes. Remove and garnish with fresh parsley if desired. Enjoy! *Nutrition is calculated using a value of 6 servings, or about 1/2 squash per serving. Serving size will vary depending on whether you serve as a meal or side dish - I calculated these servings as meal portions. 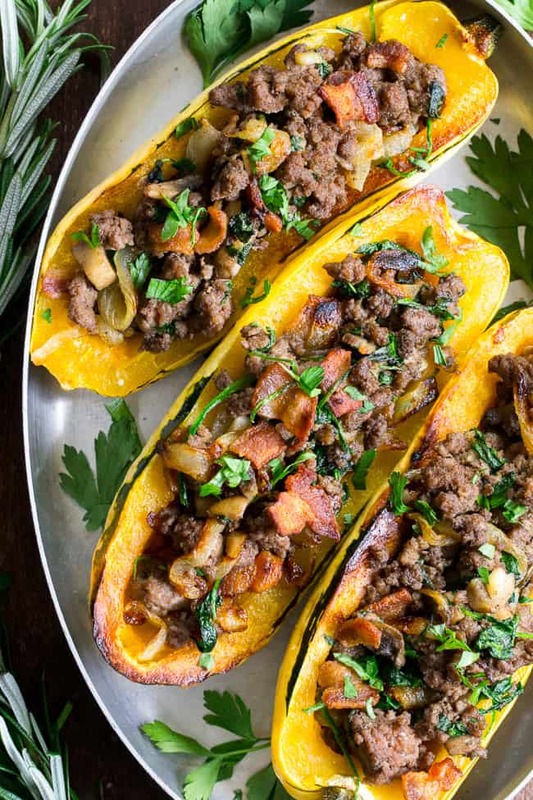 Want More Paleo and Whole30 Winter Squash Recipes? Try One of These! What’s on your dinner menu for the week? 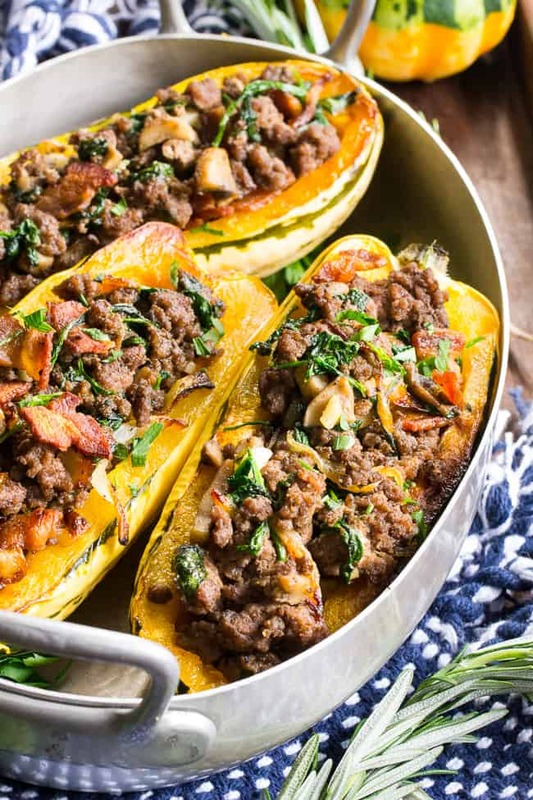 I’ve been looking for a stuffed delicate squash recipe and this looks perfect! Do you think this would work with ground turkey? Or do you need the full flavor of the beef? It looks amazing!! 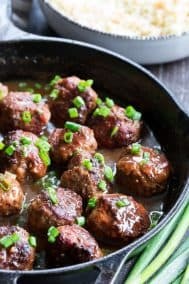 I think any ground meat will do, a bit more fat adds to the flavor but you can drizzle a touch of olive oil over it if it seems dry or lacking flavor. 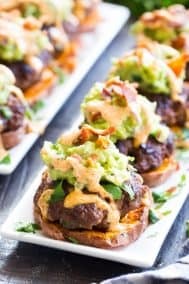 Attempting this with smaller butternut squash tonight. The only two delicata squash at the grocery store didn’t look so great. Hoping it turns out just as good as yours looks! Very good! This was my first time to try delicata squash. We love it! I’ll make this again soon! Added turmeric to the squash.. fabulous meal! Definitely a staple meal for us now. Thanks! I just made this and it was ridiculously hearty and delicious, though I made it with Italian sausage instead of ground beef. 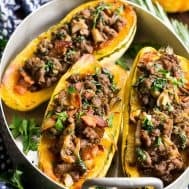 My husband doesn’t like squash (more for me!) and isn’t paleo, so I only made half of the amount of squash and mixed half of the filling with pasta for him. Win-win.